Format: HBO Go on rockin’ flatscreen. I’ve done a couple of Oscar wrap-ups for 1973 categories, and in both cases, I’ve been told that I should really watch Paper Moon. Well, I’ve finally rectified that omission in my viewing history, and those who recommended it were correct. It’s a lot of fun. It’s interesting that this came out in the same year as The Sting. Both are movies that take place in the 1930s and both are essentially about con artists. The main difference is that The Sting is about an elaborate long con while Paper Moon is about a series of short cons, and also about a relationship that at least mirrors that of a father and a daughter. A man with the unlikely and obviously fake name of Moses Pray (Ryan O’Neal) arrives late at a funeral for a woman he knew in the Biblical sense. There are only a couple of mourners, who think that Moze might be the father of the woman’s surviving daughter, Addie (Tatum O’Neal). Regardless, they ask him to take the girl to her aunt, who happens to be her last surviving relative. Eventually, Moze agrees, seeing this as a way to make a few quick dollars. On their way out of town, Moze blackmails the man who killed Addie’s mother in a car accident for $200, about half of which he spends on his car. He then buys the girl a train ticket to her aunt’s home town. Things aren’t going to go as planned, though. Addie overheard the blackmail conversation and decides that the money is hers, and that she’s going to stick with Moses until she gets her $200 from him. This is where we learn exactly what Moses’s racket is. He hunts through the newspaper for obituaries and shows up at the homes of recent widows. He tells the widows that their husband has ordered a special edition of the Bible with her name embossed on the cover in gold (something he does himself with a small printing device). Essentially, he guilts the widows into buying his cheap Bibles for a very high price and then skips out of town. Moses soon discovers that Addie is actually an asset when it comes to his scam. She’s able to see how much money the people Moses is scamming might have, and is capable of upping the price on the spur of the moment. The two perform other minor con games to make and extra $10 or $20 here and there, and Addie proves herself to be extremely competent. Things change when Moses takes up with a dancer/informal prostitute with the unlikely name of Trixie Delight (Madeline Kahn), who is pretty clearly using Moses as a way to get out of her current job as a dancer in a carnival. Trixie comes with her maid/servant Imogene (P.J. Johnson), who is desperate to get away from her employer, since she never really gets paid. Threatened by the presence of this woman coming between her and Moses, Addie plots to have Trixie caught with another man (Burton Gilliam in his screen debut). And once again, our pair are off on the road together. The third act of the film has Moses and Addie attempting to scam a bootlegger (John Hillerman), who happens to be the brother of the local law enforcement (also Hillerman). In a scam that seems to have been duplicated in the film I watched yesterday (Hell or High Water), the scam is to steal some of the man’s whiskey and sell it back to him before heading out of town. Paper Moon reminded me a great deal of The Sting, as I mentioned above. My only problem with The Sting is that it’s nothing more than a con game. It’s beautifully constructed and perfectly filmed, but it’s really just a big con. Paper Moon is in many ways the same thing with much less at stake. There’s no big score to make here, but two people scamming a few dollars here and there to keep going further down the road to the next town to do the same thing. However, this is a movie that cares about the characters a lot more and genuinely cares about the relationship between them. While Ryan O’Neal is the real star of the film, it’s Tatum O’Neal who steals it and was rewarded with a Supporting Actress Oscar, becoming the youngest winner in Oscar history. It’s also a case where one wonders about the appropriateness of the award, since she is in almost the entire movie, which would seem to indicate Best Actress except for political reasons. She’s quite good in the role, although there’s a great deal of evidence to suggest that her award-winning performance and natural appearance on camera was almost entirely manufactured by director Peter Bogdanovich. But it’s the screenplay we’re most concerned with here, and it’s a good one, although fairly predictable. We know where this is going to go, at least in terms of the relationship between Moses and Addie within the first 15 minutes. It can’t really go anywhere else. Because that’ the case, getting there needs to be made worth watching, and Paper Moon is clever enough and has interesting enough characters that it is worth watching. But it’s also very episodic, feeling like three distinct, connected stories—Moze and Addie sell Bibles, Addie gets rid of a rival, Moze and Addie scam a bootlegger. Only the building relationship carries through the film, and while it’s good, it might not be quite enough to really make the whole thing gel. Is it great? I don’t think so. I think it’s very good, though, and the decision to film in black-and-white (which apparently came from Orson Welles) adds to the feel of the film and a sense of the time. There’s a lot to recommend Paper Moon, most of it the interplay of the characters. 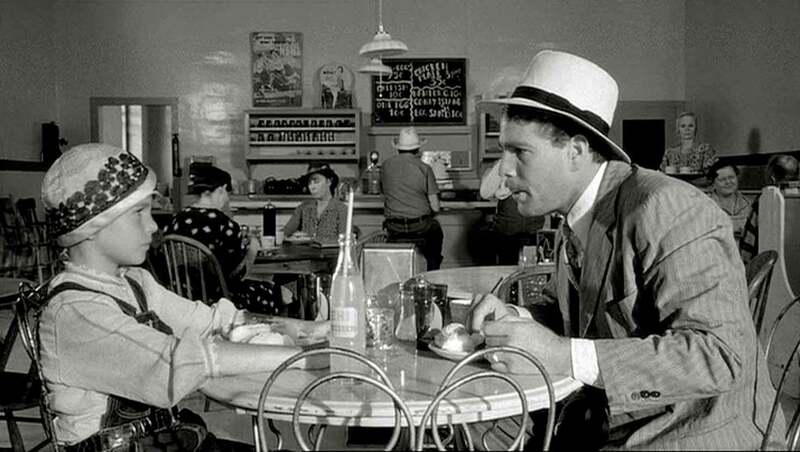 Why to watch Paper Moon: It’s a more family-friendly version of The Sting. Why not to watch: It’s too episodic. I'd agree the film has an episodic feeling but both the B&W and the performances make it feel less so. I remember it more for the performers than the story which I suppose is a mark against the screenplay. Tatum O'Neal winning in supporting is perhaps the most extreme case of category fraud in Oscar history. The girl is in all but one scene I think, if that's not a lead I don't know what. So I think she definitely deserved a nomination in lead actress but as even she pointed out in her autobiography Bogdanovich played a heavy hand in shaping her performance so she shouldn't have won. Madeline Kahn on the other hand gave a real charmer of a supporting performance. I can see the connection to The Sting even though the two films have very different overall vibes. The vibes are very different between The Sting and Paper Moon, and really, I think the intent of the movies are completely different. They kind of start from the same place, but they go in very different directions. But yes to category fraud. Tatum O'Neal is a joy in this, but if her performance was half as manufactured as claimed, she had no business being nominated for anything. And yes to Madeline Kahn, who was pretty much a charmer in everything she ever touched. I vastly prefer Paper Moon to The Sting, which I also like a lot. It's the banter between Mose and Addie that makes the film though I find Trixie and her maid absolutely priceless. Given the choice to watch only one, I'd probably watch The Sting because of just how elaborate the clockwork is and how perfectly it all falls together. It's a giant set of dominoes. We spend most of the movie setting them up and then get to watch them all fall down. It may not be a great movie. (Well, I think it is.) But I love it! I first saw it when I was a teenager and a lot more likely to watch a Godzilla movie or a Universal horror movie. I've been hooked ever since! Every once in a while, Ill see it's scheduled on cable and I'll think "Yeah, it's time to see Paper Moon again!" Paper Moon is one of those movies, like Dog Day Afternoon or Cabaret or Jaws, that make the early 1970s such a wonderful time for the movies. I don't disagree with you. There's a lot to like here, even if I can't get all the way to "love." You had me at Burton Gilliam! How 'bout some more beans, Mr. Taggart?